"The updated policy offers increased scope to consider existing trees, not just new plantings, and consideration during planning and development instead of only responding to new proposals. Mr Wall said historically, VicRoads has been seen by the community as prioritising roads, safety and movement over trees and the wider environment." And went on to confirm that they would continue to prioritise roads over trees. 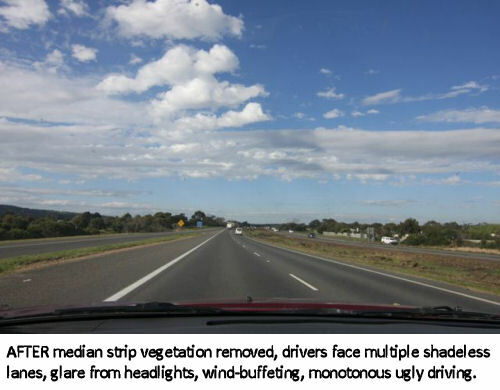 If VicRoads puts its roadbuilding above the wider environment, on which we all depend, it is plainly out of control, operating within a grandiose belief system that road-builders are more important than anything else. And along they came with the enormous tree-mulcher, right at the beginning of Spring, when most birds make their nests. 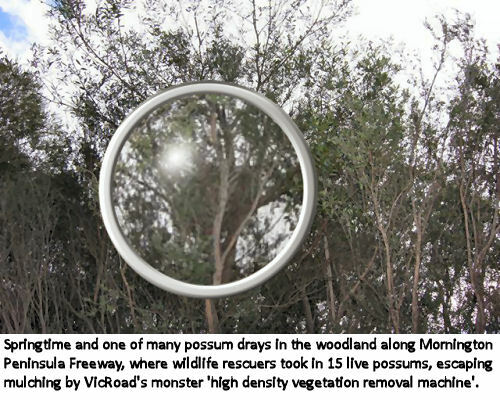 The Australian Wildlife Protection Council (AWPC) Secretary, Eve Kelly, could hardly believe her eyes as suddenly she realised that the considerably forested median strips and roadsides were being mown down at lightening speed by a monster machine. VicRoads had employed a single wildlife spotter who was overwhelmed in her attempts to save any birds, lizards, possums, koalas from the path of the giant mulcher. Eve had more success than most, in getting the Mornington Peninsula Freeway project paused by complaining to VicRoads, when she complained about the plight of the wildlife on behalf of AWPC. There were "reports of dozens of displaced animals, including ringtail possums dropping babies from nests, echidnas and blue tongue lizards being trampled by the authority's 'forestry machine' - and even being mulched alive." "Ms Kelly said 15 orphaned possums were being hand raised at WHOMP after the drama. Two young ringtails had to be put down." After complaints, VicRoads met with Brenda Marmion of Ocean Wildlife Shelter, and Eve Kelly and Craig Thomson of AWPC, with Klarissa Garnaut of Wildlife Help on the Mornington Peninsula on speaker phone. VicRoads stopped the clearing and VicRoads Program Director Bryan Sherrit said the program would be redesigned, that work would restart next year after peak summer season, and that the 'high density vegetation removal machine' would not be reused on this project. He added that 'any future vegetation removal' would use more fauna-sensitive methods. But trees are not safe with VicRoads and its safe roads project. This is the problem with corporations. They take over state services and run them for profit, and then they start creating work for themselves. VicRoads benefits from overpopulation in Australia, rolling out roads to connect new suburbs, and thinking up new jobs for its friends. Removing trees along roads is one of the more diabolical make-works they have found. They have become like the Cat with the Hat only not so funny with their expanding manic activities, backed up by huge material resources: fossil fuels and machine of inhuman size. All over Victoria, citizens are trying to stop VicRoads from running roughshod over democracy, contributing to carbon emissions, turning beautiful trees into mulch and displacing Wildlife. 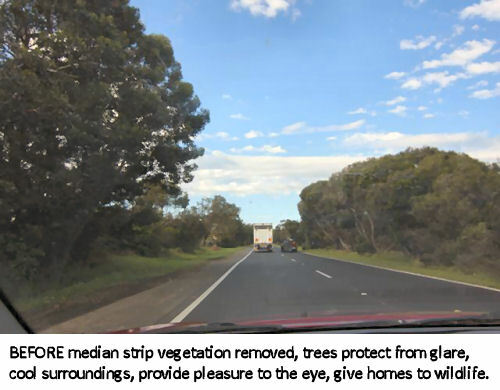 "The Latrobe Valley Sustainability Group is protesting VicRoads’ proposal to remove 90 Endangered Strzelecki Gums plus acacias and wattles (including 24 old and very old trees) as part of a road safety project on the Tyers/Traralgon Road in the Latrobe Valley. 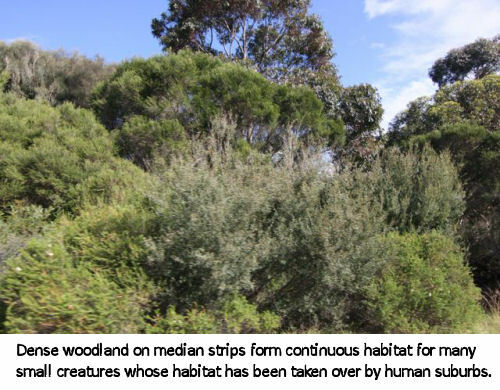 Latrobe City only has 23% remaining native vegetation." "A radical plan to remove roadside trees around the State is underway. It is apparently backed by research, but people are continuing to die on roads where trees are completely absent. Is the program, advertised widely as the “Towards Zero” safety campaign simply an environmentally costly experiment? There has been an increase of 13% in deaths from road accidents this year despite the increases in roadside tree removals." "Conservationist Sue McKinnon said the tree hollows created an important corridor for the movement of phascogales. “The success of the breeding season of the phascogale is dependent on mobility and large numbers of hollows in a wide range as the male runs around over a huge area to find females to breed with, and after this time the male dies,” she said. “If the phascogales’ movement is restricted by removal of hollows along a corridor, the breeding season may fail." Unfortunately the groups above seem to have got mixed up with Friends of the Earth (FOE), an organisation affiliated with the Socialist Alliance of AntiFa fame, political organisations which take over environmental and other political territory, but don't do much about it. In fact, many people think that, where you see a group affiliated with the Socialist Alliance, that means that the government or corporation will have an easy time. VicRoads has too much power. It should be broken up and road building be returned to local councils, which cannot work as fast and have many other priorities that would dilute the capacity for road-building to take over. The commercial press constantly reinforces evil by praising it, until people confuse destruction with something positive. "VicRoads Chief Executive, John Merritt, has announced his resignation and will depart the Victorian road authority at the end of the year. Merritt has led the authority through a program of organisational change as well as the launch of the biggest capital works program the organisation has ever undertaken since his appointment to the role in early 2014. “When I arrived the task was to transform the business and ready it to meet the needs of Victorians during a period of unprecedented population growth. We now have the biggest capital works program in our history – more than double what it was in 2014 – and we’re working hard to deliver these critical projects,” said Merritt. “VicRoads is also more responsive and accountable now. Reform is a long journey but we’re heading in the right direction. While we don’t get it right every time, we’re committed to the job and we do play a critical role in the community. “So it feels like the right time to move on. It’s been a wonderful experience to lead this organisation and I’m grateful for the fantastic support I have received,” he said. Minister for Roads and Road Safety, Luke Donnellan, also commended Merritt’s contribution. “John Merritt has been a terrific leader of VicRoads and I’d like to thank him for his service,” he said. Merritt has been in the role since April 2014, and will officially exit his role 20 December 2017." What is really really bad here is that the population growth and overdevelopment that our very bad governments have inflicted on us is here sanitised into ''meet[ing] the needs of Victorians during a period of unprecedented population growth" - as though we wanted this growth, as though we needed it, as though it were unquestionable, as though it were inevitable. That is the greatest evil in this report and it is a widespread way of presenting the terrible problem of corruption in Victorian state politics.